SINCLAIR STAINLESS ULTIMATE TRIMMER - The legendary L.E. Wilson Case Trimmer has just gotten better. Exclusive to Sinclair International, the L.E. Wilson Case Trimmer is now offered in a Stainless Steel model. We’ve paired the most accurate trimmer in the world with our Sinclair Micrometer head to create the Sinclair Stainless Ultimate Trimmer. The L.E. Wilson Case Trimmer aligns and holds your cases square to the cutter during the trim process. This results in a virtually identical trim length for each case. It is accomplished with L.E. Wilson’s unique case holder system which holds the case by the body taper. The trimmer case holder, cutter housing, and micrometer adjustment unit sit in perfect alignment. No pilots or collets are utilized which could influence the trim results negatively. Now in stainless steel, the L.E. Wilson Trimmer is built to last for a lifetime of use. Our Sinclair Micrometer head allows the reloader to easily adjust trim length in increments of .001" with an adjustment length of over 2". Our micrometer reads in “actual” case length, making it the most pleasurable micro trimmer to work with. Determine your trim length, dial to the exact length on the micrometer, and you’re ready – it’s that simple. 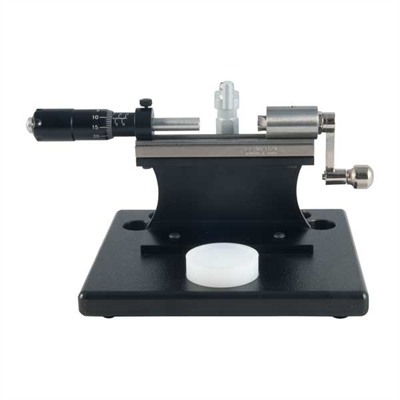 The micrometer features crisp, easy-to-read engravings and may be locked in place when set. Easily accommodates cases from 22 Hornet to 416 Rigby. When trimming cases shorter than 1.3” such as pistol cases, the use of a spacer (part number WX11) is necessary. Completing the Sinclair Stainless Ultimate Trimmer is our Sinclair Mounting Stand with Shark Fin Clamp. This system makes easy work of installing and removing your trimmer case holder in a smooth “swing-arm” motion. The Shark Fin trimmer clamp secures the case head firmly against the micrometer adjustment head for a quick and accurate, chatter-free trim. * Trimmer Case Holders and accessories sold separately. PLATFORM - The idea for this platform originated from a writer/customer of ours. The platform is a mounting board for the L.E. Wilson trimmer series that provides storage space for nine (9) case holders and a tapping block for knocking the cases out of the holder. The polyethylene platform has rubber feet, but most of us prefer it c-clamped to the bench.